Magnificent or Mundane? How Would You Describe Your Instruction? A student is intrigued by GoAnimate for Schools. Use of technology is increasing exponentially in classrooms throughout the world. What appears to be modern technology today will likely be outdated tomorrow. Budget constraints and the impressive price tags associated with many devices and programs that facilitate the integration technology into the curriculum can make it appear that engaging, educational resources are unattainable. With GoAnimate for Schools, that simply isn’t true! GoAnimate for Schools allows both teachers and students to add pizzazz to learning. With a little creativity, the possibilities are endless! 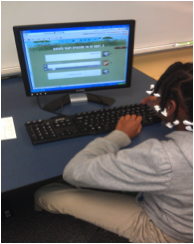 GoAnimate videos can be used to facilitate flexible learning centers. Create a video that briefly reviews a concept that a group of students has struggled with, or create a video to preview vocabulary for students who lack prior knowledge. You write the script, and GoAnimate delivers it in a way that is sure to capture their attention. While you are working with a small group of students, GoAnimate is delivering quality instruction to another group. Aristotle said it best, “Pleasure in the job puts perfection in the work.” If they enjoy what they are doing, they will put forth their best effort. Your students will LOVE GoAnimate! How many students can you think of who would love to use characters and scenes to explain a scientific concept but would refuse to work if given paper and pencil? Further, creating GoAnimate videos to explain concepts requires students to thoughtfully consider what they have learned. You’ve got it… that would mean using those “higher order thinking skills” that are all the buzz. Have information you need to present to other faculty members? Let GoAnimate steal the show! You can incorporate specific names and insert extended pauses to allow opportunities for responses and audience interaction. Make your instruction magnificent and memorable. Use GoAnimate for Schoolsto motivate students of all ability levels to reach new levels of understanding. You will not be disappointed!